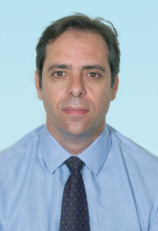 Gerasimos joined Info Quest in March 1999 and moved to Quest Holdings in January 2011. Gerasimos has accumulated more than 25 years of work experience and before joining Info Quest, he had already worked for Greek and multinational companies. He started his career at FIMISCO S.A. (Financial Mining -Industrial & Shipping Corporation) and in 1987 moved to RANK XEROX HELLAS S.A. In 1989 he joined TELETYPOS S.A. (Mega Channel), the TV station that marked the dawn of private broadcasting in Greece. During his professional career he has participated in the development of numerous projects in the area of Human Resources. Gerasimos holds a BSc in Accounting-Finance from Deree – The American College of Greece and a Master's degree in Business Administration with specialization in Human Resource Management from Baker College, Center for Post Graduate Studies in Michigan, USA. Gerasimos is a member of the Human Resources Directors Committee in SEV and a volunteer member of Young Entrepreneurs Organization, Junior Achievement in Greece, participating in many programs, from its founding until today.